An interesting diverse program of American Standard Classics (Gershwin, Ellington, Porter), Jazz styles of various eras, World Music – Balkan/Gypsy – Roma, Latin/Brazilian/Tango Jazz & Classical Music influences. 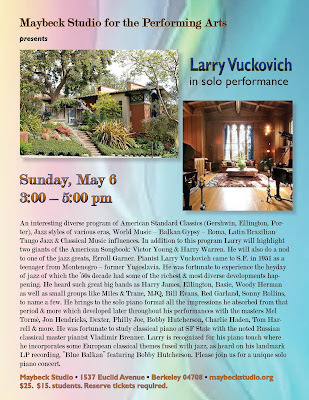 In addition to this program Larry will highlight two giants of the American Songbook: Victor Young & Harry Warren. He will also do a nod to one of the jazz greats, Erroll Garner. 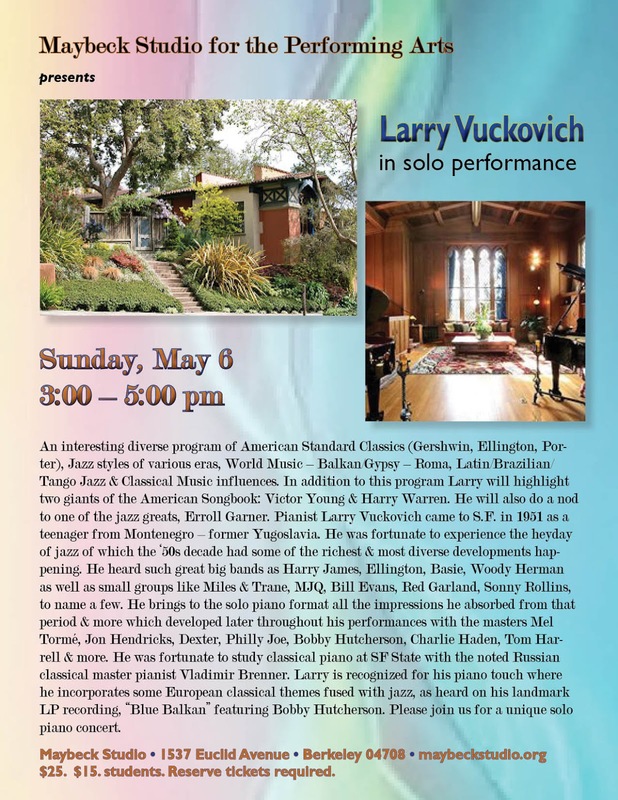 Pianist Larry Vuckovich came to S.F. in 1951 as a teenager from Montenegro – former Yugoslavia. He was fortunate to experience the heyday of jazz of which the ‘50s decade had some of the richest & most diverse developments happening. He heard such great big bands as Harry James, Ellington, Basie, Woody Herman as well as small groups like Miles & Trane, MJQ, Bill Evans, Red Garland, Sonny Rollins, to name a few. He brings to the solo piano format all the impressions he absorbed from that period & more which developed later throughout his performances with the masters Mel Tormé, Jon Hendricks, Dexter, Philly Joe, Bobby Hutcherson, Charlie Haden, Tom Harrell & more. He was fortunate to study classical piano at SF State with the noted Russian classical master pianist Vladimir Brenner. Larry is recognized for his piano touch where he incorporates some European classical themes fused with jazz, as heard on his landmark LP recording, “Blue Balkan” featuring Bobby Hutcherson. Please join us for a unique solo piano concert.